Climate change can negatively affect crop productivity decreasing food production in many regions across the world. Literature suggests forest carbon sequestration (FCS) is a good alternative to mitigate climate change due to its ability to sequester carbon at low cost. Nevertheless, FCS subsidies have not been addressed together with impacts on food security and climate change reduced crop yields. 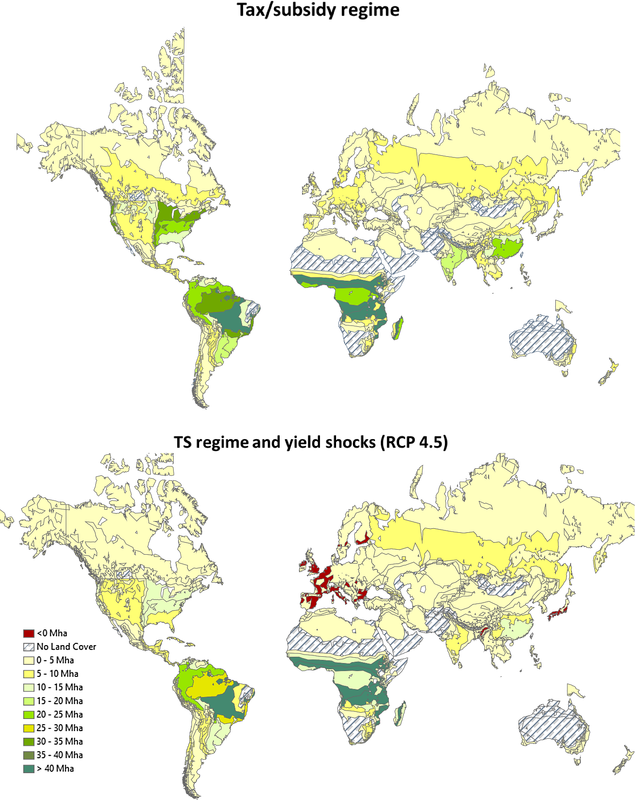 In our multidisciplinary work, we collected the crop yield shocks from global circulation—crop modeling. We also developed a new version of a computable general equilibrium model for the economic analysis. Thus, we evaluate the global economic impacts of using carbon taxes and FCS to achieve 50% emission reductions. We find that implementing an aggressive FCS incentive can cause substantial increases in food prices because of land competition between forest and crop production. Without climate induced yield reductions, FCS is attractive, but not with the yield reductions. With the climate induced yield shocks, food price increases are huge—so large that it is clear this approach could not be adopted in the real world. The results cry out for investment in agricultural research on climate adaptation. Our findings suggest economic well-being falls more without mitigation than with 50% emission reductions. The online version of this article ( https://doi.org/10.1007/s10640-019-00339-6) contains supplementary material, which is available to authorized users. A correction to this article is available online at https://doi.org/10.1007/s10640-019-00343-w. In recent decades, economic expansion and population growth have triggered acceleration in anthropogenic greenhouse gas emissions (GHG), the most important contributor to global warming (Kouhestani et al. 2016). The pace of climatic changes without mitigation projected by scientific consensus is dramatic and poses grave consequences for the global economy and food security (The CNA Corporation 2007). Most economic sectors contribute to GHG emissions, among them, agricultural activities, non-renewable energy generation, and transportation based on fossil fuels are the major contributors (IPCC-WGIII 2014b). Agriculture alone was responsible for about 11% of greenhouse gases (GHGs) emissions in 2012 (Annex 1). Agricultural emissions can be associated with intermediate input use (e.g., N2O from fertilizers), primary factors (e.g., CH4 releases from rice land and livestock production) and sectoral outputs (Golub et al. 2010; Herrero et al. 2016; US-EPA 2006). There is a plethora of literature that describes the interaction among climate change, crop production, and food security. These studies show that under adverse effects of climate change on agricultural activities, many regions can suffer from deficiencies in their food supply (Burke and Lobell 2010; Challinor et al. 2014; Gregory et al. 2005; Lobell et al. 2008; Rippke 2016; Schmidhuber and Tubiello 2007; Stern 2007). Climate change can negatively affect crop productivity in many regions across the world depending on the location and type of crop (IPCC 2007; Nelson et al. 2010; Ouraich et al. 2014; Qaderi and Reid 2009; Stern 2007). Additionally, the demand for most agricultural products is often inelastic. Hence, a negative shock in food supply results in food price increases (Lobell et al. 2011; Roberts and Schlenker 2010). This could limit the ability of some regions to provide enough food for their population (GCEC 2014; Nagy 2006; Stern 2007). Governments are worried about the negative impacts of climate change on their societies, as pointed out by Former President Obama, climate change is the ‘greatest long-term threat facing the world’ (Julie Hirschfeld Davis MLaCD 2016). Thus many nations have agreed in collaborating to mitigate climate change. Forests help to reduce GHGs by sequestering CO2 from the atmosphere as part of their photosynthesis process (Daniels 2010; US-DOE 2010). For this reason, reforestation and reduction of deforestation have been recognized as efficient and effective alternatives to mitigate climate change. A substantial body of evidence suggests that this method is relatively less expensive than other types of mitigation (Adams et al. 1999; Golub et al. 2010; Richards and Stokes 2004; Sheeran 2006; Sohngen and Mendelsohn 2003; Stavins 1999), bringing the attention of policy makers in the last quarter century (Goetz et al. 2013; Golub et al. 2009; Stern 2007; US-DOE). Previous literature has evaluated the impacts of FCS incentives on the global food supply. Golub et al. (2013) have found that FCS incentives could increase livestock and food prices. Hussein et al. (2013) have made a similar argument and concluded that a FCS subsidy could elevate poverty in less developing countries due to its adverse impact on food price. While these seminal papers highlighted the implications of a FCS policy for food prices, they did not include the fact that climate change may reduce crop yields in future, and that could increase the food price impacts of this policy. These papers limited their analyses to about $27/tCO2e carbon price. This level of carbon price induces limited expansion in FCS. To achieve a larger expansion in FCS a higher carbon price is needed (Golub et al. 2010). For instance, Sohngen (2009) has shown that for a maximum 2 °C temperature change scenario, FCS should increases by 178% between 2010 and 2100, and that requires about $130/tCO2e carbon price to compensate the opportunity costs of land transferred to forest. This author has stated that a large expansion in FCS could largely increase food prices, and that further elevates the opportunity costs of FCS. The evaluation of an aggressive FCS policy in the presence of climate change effects on crop yields has not been carefully evaluated. Thus, more research is needed in evaluating the economic net benefits of reducing climate change effects, the types of mitigation methods and the cost of delaying efforts (The Whitehouse 2014). This paper aims to improve our understanding of the interplay between climate change, mitigation policies, and their impacts on the global economy by addressing the following important questions: What is the cost of emissions reduction with no FCS incentive? What is the mitigation cost incorporating FCS? What are the impacts of FCS on food security? What are the consequences for the global economy and food production when crop productivity is affected by climate change? And, what is the economic value of reducing crop yield losses? To fulfill our objectives, we elaborate a multidisciplinary approach (Fig. 1). The main component of this approach is a modified version of a well-known computable general equilibrium (CGE) model, GTAP-BIO-FCS. This model is used to evaluate the economic and land use impacts of emissions reduction targets and policies under alternative climate scenarios. The examined climate scenarios are RCP8.5 and RCP4.5. The first scenario represents the case of business as usual with no mitigation effort. The second scenario implements a global target to reduce emissions by 50%, according to the Paris accord. To achieve this level of emission reduction, we examined two alternative polices: (1) A global uniform tax on all types of GHGs (in $/tCO2e) and (2) a global uniform tax plus an equivalent FCS subsidy. For the given emission reduction target, the implemented CGE model endogenously determines the corresponding tax/subsidy rates in $/tCO2e. To take into account the impacts of climate change on crop yields, we collected data on the existing projections for future changes in crop yields for the examined climate change scenarios. These projections were obtained from the existing estimates developed by the agricultural model intercomparison and improvement project (AgMIP) (Villoria et al. 2016). These projections and the emissions reduction target were introduced as exogenous shocks to the CGE model for each alternative policy (either tax or tax-subsidy). We chose a comparative static framework because using a dynamic framework requires many exogenous assumptions that, in turn, impact the results of the analysis. Our objective was to isolate the impacts of climate change shocks and the carbon tax and FCS subsidy policies over an intermediate time horizon. Our research contributes to the literature in several ways: (1) It develops a new CGE model entitled GTAP-BIO-FCS, which unlike its predecessors is suitable for the economic analysis of different mitigation practices including carbon tax, FCS, and biofuel production; (2) It provides evidence of the impact of FCS incentives on food security; (3) It highlights the economic and environmental consequences of including climate change crop yield impacts in the mitigation analysis. Many studies have explored climate change impacts from different perspectives: projecting population, income, damages on infrastructure, health, among others. They have used a wide range of approaches such as integrated assessment models and dynamic modeling (Cai et al. 2016; van der Mensbrugghe 2013). Instead, following Hertel et al. (2007a) and Golub et al. (2009, 2013), we used a comparative static approach to isolate the impacts of emission reduction polices and crop yield shocks from the impacts of other major factors such as population growth, capital accumulation, income changes, and intertemporal discounting (Weyant 2014), which can interact with climate variables in a dynamic modeling framework. These types of interactions are important subjects, but they are not the focal point of this research. Furthermore, a dynamic model requires assumptions on many of these factors, which make interpretation of the climate induced results problematic and uncertain. Our comparative static model reflects the overall intermediate impacts of climate change and mitigation policies on the economy. This approach does not trace the annual changes in the variables of the system. However, it allows us to isolate the impacts of climate change and mitigation policies from many other factors which their future changes are very uncertain and extremely difficult to project. CGE modeling is recognized for being suitable for the evaluation of policy analysis including climate change mitigation (Golub et al. 2008; van der Mensbrugghe 2013). As shown in Fig. 1, a large scale CGE model (e.g. GTAP-BIO-FCS) provides an analytical tool to study the global economy as a complete system of interdependent components (industries, government, households, importers, exporters, investors) and represents producer and consumer behaviors. These models are capable of evaluating the impacts of exogenous shocks on the global economic systems. These shocks can range from policy changes, technology or productivity shocks, biofuels policies, to climate change. CGE models include equations to represent demands and supplies of all goods and services produced or traded in an economy. They also represent markets for primary factors of production including labor, land, capital, and resources. These models begin their simulation process from an equilibrium condition (imbedded in their benchmark database) and determine changes in economic and non-economic variables due to exogenous shocks outlined above, while maintaining markets for goods and services, and primary inputs in equilibrium. The economic variables usually are prices, outputs, quantities demanded for intermediate and final uses of good and services, income, welfare, and many more. In addition to the economic variables, some CGE models may trace changes in non-economic variables as well. For example, the GTAP-BIO-FCS is capable of tracing changes in emissions associated with economic activities and follow allocation of land between its alternative uses (forest, pasture, and cropland) across the world as shown in Fig. 1. The large scale multi-regional and multi-sectoral CGE models (such as the one we used in this paper) have several advantages over the partial equilibrium models which usually designed to analyze a small number of markets. The main advantages of the large scale CGE models are: (1) they built on a solid theoretical microeconomic foundation—general equilibrium theory; (2) they take into account resource constraints and trace changes in macroeconomic variables; (3) they trace changes in all economic activities and markets; (4) they capture interactions among all economic agents including producers, consumers, government, and owners of resources; (5) they take into account tradeoffs among all economic activities including production, consumption, and trade; and (6) they can be used in a wide range of economic and environmental analysis (Hertel et al. 2007b). GTAP-BIO-FCS, which is a large scale CGE model, carries all of these advantages and conveys additional properties, explained in the next section, which make it an excellent tool for the questions we are addressing in this article. Burniaux and Truong (2002) developed a GTAP expansion called GTAP-E to analyze trade-energy-environmental policies. This model allowed substitution between energy and capital, substitution among energy sources and highlighted interactions between energy and other economic activities. McDougall and Golub (2007) debugged this model and improved it to calculate welfare more accurately and cover a wider range of emissions reduction options for environmental analysis. Both the GTAP-AEZ-GHG and GTAP-BIO models, the parents of GTAP-BIO-FCS, were built based on this model. In what follows we introduce the background of these two models. Hertel et al. (2009) added a land use module to the standard GTAP model to provide a framework for assessing mitigation options for land use emissions. The new model (named GTAP-AEZ) was able to depict competition among land using sectors (crop producers, forestry, and livestock) and trace change in land cover items (forest, pasture and cropland) across the world by Agro-Ecological Zones (AEZ). Golub et al. (2009) combined the GTAP-E and GTAP-AEZ models to incorporate the most prominent Kyoto-GHG emissions (CO2 and non-CO2) and implement different mitigation practices such as FCS, better fertilization, land use adaptation and other miscellaneous activities. The new model was named GTAP-AEZ-GHG. Then Golub et al. (2013) improved this model by adding additional emissions information, changing the geographical aggregation of the model from 3 to 19 regions, and dividing the ruminant sector into meat ruminant and dairy sectors. Nevertheless, this model was developed prior to the biofuel era. Therefore, it does not include the interactions between energy and agricultural markets via biofuels and their implication for FCS. In a different line of research, Birur et al. (2008) introduced biofuels into the GTAP-E model and combined that with the GTAP-AEZ model and developed the first version of the GTAP-BIO model. This model and its data base have been frequently improved and extensively used to analyze the economic and land use implications of biofuel production and policy (examples are: Taheripour and Tyner (2010); Hertel et al. (2010); Taheripour and Tyner (2013)). The modifications made in this model mainly advanced its land use module to better represent land allocation among its alternative uses and tuned the parameters of the model according to real world observations. The land use module of this model uses a three-level nested Constant Elasticity of Transformation (CET) function to govern land allocation across its alternative uses in each AEZ. The bottom nest of this nesting structure allocates land between forest and the mix of pasture-cropland. The middle nest distributes the mix of pasture-cropland between these two land types. Finally, the upper nest allocates cropland among alternative crops. The model uses: land transformation elasticities tuned to actual observations; available land and its initial distribution across uses in the base year; and changes in land prices to endogenously determine land use changes in response to changes in economic variables and crop yield shocks [for details see Hertel et al. (2009) and Taheripour and Tyner (2013)]. We include CO2 and non-CO2 GHG emissions as well as forest carbon stocks. We also incorporate both biofuel and FCS in our modeling framework. The annual FCS (measured in MtCO2/million $ of forest value output) is based on the Global Timber Model developed by Sohngen and Mendelsohn (2007) and calibrated by Golub et al. (2013) to be used in CGE modeling. The original abatement curves were developed for a 20-year horizon assuming harvest and tree rotations, which are then converted into annual-equivalent FCS. Nevertheless, the model has also been used previously to evaluate FCS in long-time horizons (such as 2100), as described in Sohngen and Mendelsohn (2003). Changes in management and rotation systems for 2100 are uncertain and are not the focal point of the study. We consider the annual-equivalent FCS obtained by Sohngen and Mendelsohn (2007) as our representative annual FCS assuming that the forest tree rotation system for our long-term horizon will behave similarly as in their modeling framework (i.e., some fraction of the trees is planted, and others are harvested annually). We then split the annual FCS into two components: FCS associated with forest land and FCS associated with managing biomass used by forest industry. This permits us to implement sequestration incentives on these inputs separately, rather than subsidizing the mix of the two. It also ensures the correct capture of subsidies paid on these inputs and maintains balance of the regional Input–Output (I–O) Tables . GHG emissions associated with: land used in rice production; capital used in livestock industry (dairy farm cattle, ruminant and non-ruminant livestock); and outputs of fossil fuel and agricultural sectors are included. We consider these emissions as dirty primary input factors. Thus, these GHGs are now included in the I–O tables as ‘dirty’ endowments. This allows keeping the accounting balances in order to obtain consistent equilibria in the capital account and welfare. We elaborated an “add-on” tool entitled GTAP-VIEW which provides checking of the equilibria and accounting balances in the model. The GTAP based models trace changes in welfare—measured in terms of equivalent variation (EV)—due to changes in economic variables. A standard GTAP model uses a program to decompose changes in welfare into several categories such as changes in: terms of trade, primary factors of production; net of saving and investment; allocative efficiency; and several other categories. The GTAP extensions, which deviate from the structure of a standard model, cannot use this program. 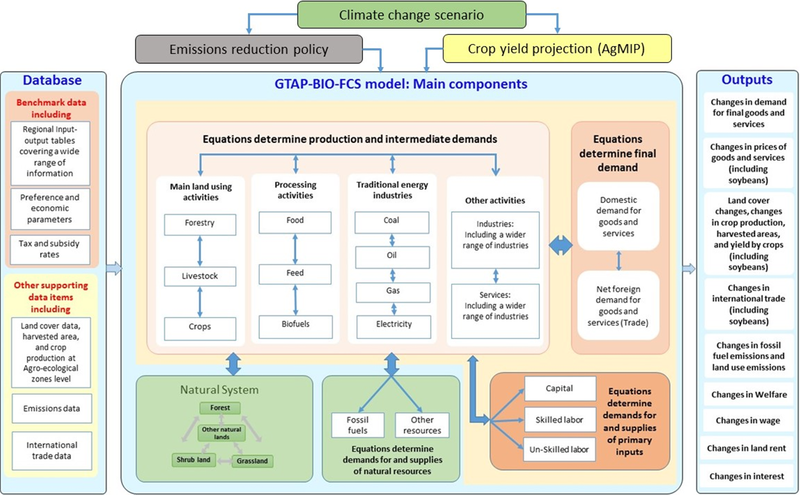 The addition of FCS into the database, introduction of biofuels and their by-products, modifications related to the FCS subsidy and carbon tax, and the inclusion of emissions into the I–O tables alter the standard GTAP modeling framework. Thus, we developed a new version of the welfare decomposition program that correctly captures the sources of welfare variation given the modification we made in the model. Thus, our GTAP-BIO-FCS model provides a more comprehensive basis for climate change mitigation including alternatives such as FCS and biofuels. To evaluate the consequence of climate change on crop yields we relied on the existing projections developed by the AgMIP community (Villoria et al. 2016). This community uses crop models in combination with General Circulation Models (GCMs) to project future changes in crop yields under alternative climate scenarios. GCMs are climate models that employ mathematical modeling to represent atmospheric, land, and oceanic variations. These models calculate winds, changes in temperature and heat, radiation, humidity, among other climate variables. Thus, they are commonly used to evaluate climate change. Crop models take the climate parameters from the GCMs to project future changes crop yields given soil and weather conditions, and choice of crop management practices (Jones et al. 2003; Lapola et al. 2009; Liu et al. 2007; Rosenzweig et al. 2014; Tan and Shibasaki 2003; Williams et al. 1989). The AgMIP community projected future changes in crop yields for a wide range of crop models, alternative GCMs, several RCP scenarios, and various crops at the global scale with a 0.5° × 0.5° resolution (Rosenzweig et al. 2014). Villoria et al. (2016) have made these simulation results accessible to public on the GOSHARE website at: https://mygeohub.org/tools/agmip. We obtained the crop productivity data (in metric ton/ha) for the period 2000–2099 through the online AgMIP package at grid cell level for two RCPs: RCP8.5 and RCP4.5. We collected information for eight different crops: maize, soybeans, millet, rice, rapeseed, sugarcane, sugar beets, and wheat by irrigation type (i.e. rainfed and irrigated). The data is then grouped by the AGMIP aggregation tool by crop, country, and AEZ for each irrigation type. Once we collected the data, we further aggregated the data by GTAP region, AEZ, and crop sector. Finally, we utilized the data to calculate our crop yield shocks. This procedure is described in more detail in Annex 2, and the exogenous crop yield shocks are presented in the Supp. Table 1. The calculated shocks in crop yields are then used in our experiment as explained in the next section. Overall, crop yields were expected to decrease over time due to climate change in both RCPs. In general, the adverse effects are higher (almost twice as strong) in RCP 8.5 for most regions and crop sectors of the world. This is partially due to the higher radiative forcing assumed in this scenario as well as higher variation in temperature and other climate variables (Annex 2, Supp. Tables 1a and 1b). In this paper we assumed that improvements in crop yields due to technological progress would roughly equal increases in demand for food due to population growth, higher income, and dietary transition. In the past, this assumption has generally hold over time. However, it may not hold in the future. Crop Yield under Business as Usual (CYBAU) This case provides insights of the costs for the global economy of the adverse effect of climate change with no mitigation efforts. In this simulation, we implemented crop yield shocks (by region and crop sector at the AEZ level) in our model following the Representative Concentration Scenario 8.5 (RCP8.5) of the IPCC 5th Assessment Report (AR5), which assumes consumption and production behaves as usual (BAU) with no mitigation (Riahi 2011; Wayne 2013). Tax regime for GHG reduction (Tax-Only scenario) This experiment implements a global uniform carbon tax to achieve a 50% reduction in net emissions from consumption, endowments, and production. This tax is uniformly applied to all goods and services and primary factors of production at the global scale. This target of emission reduction follows the projections of the RCP4.5 of the IPCC AR5 (IPCC-WGIII 2014a). GHG tax-subsidy regime (Tax-Subsidy scenario) This experiment uses a two-part instrument which consists of a carbon tax and an equivalent subsidy on carbon sequestered in forestry to achieve the goal of 50% reduction in emissions. Tax regime in the presence of crop yield shocks (Tax + CY) We implemented the tax regime taking into account changes in crop yields due to climate change. 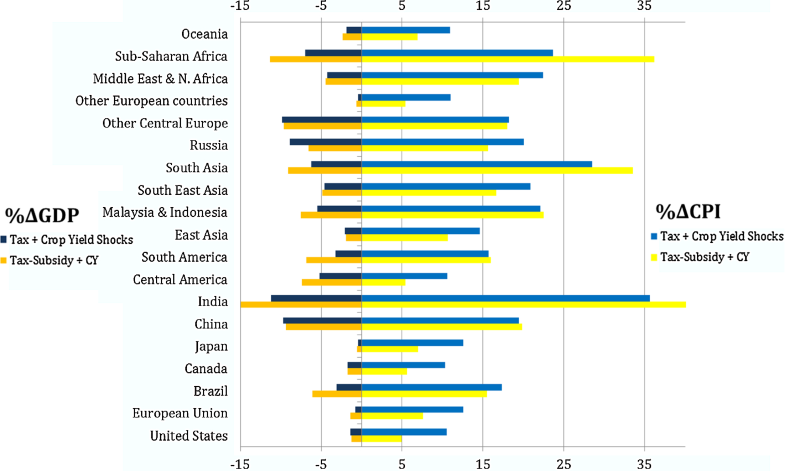 This experiment captures the cost of emissions reduction when climate change affects agricultural productivity and is a better representation of the global agricultural sector. 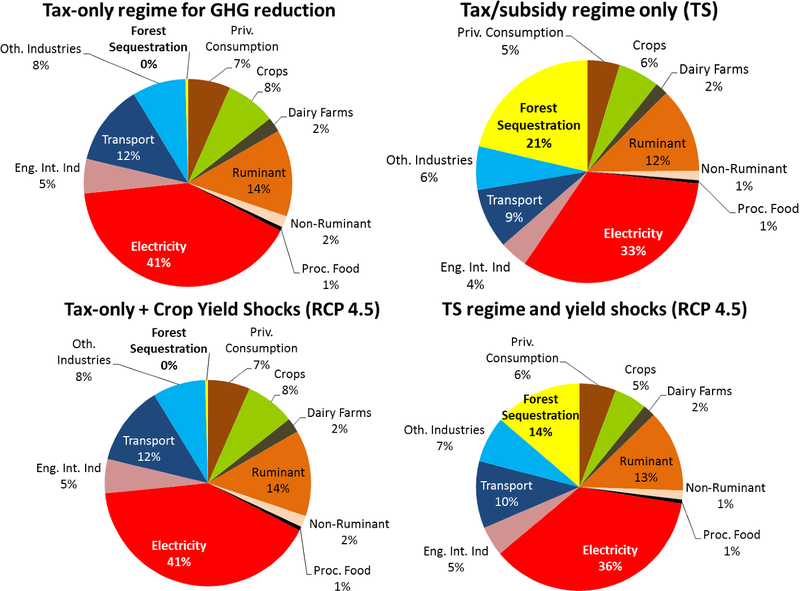 GHG Tax-subsidy regime in the presence of crop yield shocks (TS + CY) This experiment implements the tax-subsidy policy together with the same climate change induced crop yield shocks used in the Tax + CY case. The TS + CY scenario was included to evaluate the additional costs of implementing FCS in the presence of climate change on agricultural productivity. Our simulations display a wide range of results in terms of economic and environmental variables at the sectorial and regional level. Here, we present the key results to highlight the interactions among mitigation policies, FCS, and climate change induced crop yield shocks, and their implications for food security. A tax rate of $150/tCO2e is required to reduce emissions by approximately 13.5 GtCO2e worldwide (50% global emissions reduction from our baseline economy). This is a large value, but is consistent with results from previous studies which utilize entirely different models and analytical structures (e.g., Sarica and Tyner (2013), Girod et al. (2012), Van Vuuren et al. (2007), Kim et al. (2006), among others). This global uniform tax on emission forces many economies to either use cleaner technologies or move away from carbon-intensive sectors. Thus, electricity sector production falls by 53% and accounts for 41% of the global reduction (− 5.5 GtCO2e). Similarly, other industries decreased emissions 20-75% to achieve the target. With no subsidy, FCS contribution to emissions reduction is negligible (Fig. 3). In terms of agricultural activities, the ruminant sector decreases its emissions drastically (by about 60%) to account for 14% of the mitigation. This can dramatically affect the livestock sector, especially in regions with high carbon intensity emissions, a result which is supported by Avetisyan et al. (2011) analysis. When the subsidy on FCS is included, the tax-subsidy rate required to reduce the same quantity of GHG as our Tax-Only scenario is $80/tCO2e. This value is consistent with the original set-up of the RCP4.5 developed by the Joint Global Climate Change Research Institute, which establishes that carbon prices (expressed in 2005$) should reach a value of $85/tCO2e by 2100 (Thomson et al. 2011). The Tax-Subsidy scenario shows that FCS plays an important role in climate change mitigation. Approximately 3 GtCO2e (i.e. one-fifth of the GHGs reduction) is due to the capture of CO2 by forest. This occurs mainly in regions with vast forest, such as South America (i.e. Amazon Region), Central America, Sub Saharan Africa, United States and India. Including climate change impacts on agriculture produces an overall decline in crop productivity for most of the agricultural sectors and regions of the world (Supp. Tables1a and 1b). In 2004, the database shows that crop sectors emitted about 8% of the global net emissions. When implementing the tax on emissions, agricultural crops provided 6% of the share in the mitigation effort whereas non-crop sectors represented the other 94% share. Thus, including the adverse crop yields increases the carbon tax only by $5/tCO2e making the rate equal to $155/tCO2e. In addition, due to the absence of incentives for FCS and the small increase of the tax rate, production in all sectors declined proportionally, which kept their shares in GHG reduction relatively constant. With the crop yield decreases, a larger tax-subsidy rate ($100/tCO2e) (compared to the Tax-Subsidy case) is required in order to encourage movement of land from agriculture towards forest in order to achieve the 50% net emission reduction. Considering this competition for land, it is expected that the global afforestation would not be as high as before. This means that the mitigation effort must be greater in other industries, especially carbon-intensive sectors. Thus, the FCS share of emissions reductions falls substantially (Fig. 3) (from 21% to 14% share). This result clearly demonstrates that FCS becomes somewhat less attractive once climate induced crop yield changes come into the picture. At the regional level, many economies (Europe, Japan, Canada and China) are discouraged to afforest due to decline in agricultural productivity, which leads them to use more land for crop production to satisfy their domestic consumption and exports of agricultural commodities. Thus, FCS is lower, forcing other industries (Fig. 3) to have a bigger role. In contrast, for regions with vast forest (Brazil and Sub-Saharan Africa), the share of FCS is still one of the major contributions in GHG reduction due to the benefits of the sequestration subsidy. The imposition of the tax regime encourages emission reductions for all the sectors in the economy, especially in regions-sectors with high carbon-intensity and/or large production. Electricity, ruminant and transport sectors account for most of the mitigation effort (about 55%). Afforestation’s contribution is negligible because there is no incentive for FCS, whereas agricultural crops’ share in the emission reduction is small (about 6%). Hence, there is no significant land use change among cover types (Supp. Figure 2) when imposing only a tax regime because the penalty is mostly reflected in price increases for carbon emitter industries (e.g., oil, gas, energy-intensive industries, coal, ruminant livestock, among others). The only region with significant land use change is Sub-Saharan Africa which has a reduction of pasture land due to decreases in livestock production. This land is moved towards forest cover (+ 35 Mha). Nevertheless, the area variation across crop sectors in many regions is heterogeneous. This is to a great extent due to two factors. First, land is moved away from crops that are heavily penalized by the carbon tax. Thus, paddy rice area declines, especially in Asia (i.e. China, India, and South East Asia), because land growing rice emits methane to the atmosphere. This leads to expansion in the other crop sectors, especially for coarse grain and oilseeds as well as vegetables, fruits and other products (i.e. considered in the “other crops” category). Second, the tax encourages increased biofuels use, which requires increases in the production of corn and soybeans (mainly in US), rapeseed (especially in the European Union), palm (in Malaysia & Indonesia), and sugar crops (in Brazil). Hussein et al. (2013) stated that implementing a FCS subsidy increases return to forest land, and that provokes land movement in favor of forest. Our results align with their conclusions. With the tax/subsidy regime, about 700 Mha are reforested globally whereas cropland decreases by 378 Mha. The main increase in forest cover occurs in the tropical and temperate climates with long growth periods (e.g. AEZs 4–6, 10–12). Figure 4 shows how the incentive in FCS attracts afforestation in most of the regions of the world. As expected, expansion of forest land cover occurs at the expense of cropland and pastureland in each scenario. This is mainly due to the high subsidy level which benefits places with vast forests depending on their carbon sequestration intensity. On average, a hectare of forest sequesters about 4.28 MtCO2 per year. With a subsidy of $80/MtCO2, the revenue per hectare for FCS is $342. The costs of FCS are relatively low, so it is easy to see why the FCS subsidy is so powerful in moving land from agriculture to forestry. The cropland reduction (Fig. 5) is distributed to regions where crops are grown. The main affected sectors are “other crops” globally (− 112 Mha); coarse grains in Latin America (− 15 Mha), US (− 13 Mha) and Sub-Saharan Africa (− 27 Mha); oilseeds in US and South America, and paddy rice globally (− 60 Mha). The reduction of cropland in the Tax-Subsidy scenario drives up land rent for almost all crop sectors, AEZs, and regions of the world affecting especially economies that are more land intensive in production. In addition, our modeling framework allows for technological adaptation in agriculture (e.g., breeding for heat resistance, new machinery, etc.) that permits substitution among land, labor and capital. Thus, as an indirect result, there is also substitution of land by labor (both skilled and unskilled) and capital (i.e. except for carbon-intensive industries such as dairy farms and ruminant sectors). If agricultural industries cannot substitute land with capital and labor, the negative impacts on crop production could significantly increase. Then higher tax-subsidy rates would be needed to reduce emissions by 50%. This means that with no substitution, the FCS policy becomes more expensive. On the other hand, while area of cropland falls in many regions, crop outputs drop at lower rates. This is in part attributed to a boost in productivity (through technological adaptation improvements) to partially offset the land reduction. Hence, forest expansion due to FCS incentives has two effects on agriculture, in our Tax-Subsidy experiment: (1) Forest expansion bids land away from agriculture and (2) It encourages improvements in land productivity by using more labor and capital to avoid sharp reductions in crop outputs. In fact, in this case, there is a significant increase in capital and labor in agriculture such that crop yields increase significantly. This substitution of other factors, capital and labor for land occurs in any CGE model. To test the sensitivity of the implied high degree of productivity increase, we repeated the Tax-Subsidy experiment with restricting crop yields to be fixed. There are still some substitutions among primary inputs in this restricted case, but much less than the case without restriction. The result is that welfare decrease is much higher in the restricted case. One cannot be sure what degree of agricultural productivity increase would occur, but even with yield fixed, welfare falls less with the tax-subsidy case than with the tax-only case (this is discussed overall in Sect. 3.7). With decreased crop yields in many areas (Annex 2), the only possible responses to satisfy a given crop demand are either through extensification of agricultural land or importing products from other regions. Only a third as much cropland is converted compared to the Tax-Subsidy scenario and 20% less land is moved to forest (about 141 Mha less). Thus, with the reduced crop yields, less land is available for FCS (Fig. 2), so there is less afforestation and more pasture land is converted to avoid decreases in cropland. Hence, there is an expansion in global harvested area (Fig. 5) for all the crop sectors compared to the Tax-Subsidy scenario including paddy rice. In addition, land becomes more valuable driving up its rent in many places of the world (Annex 3). Here, we discuss both policies of tax and tax-subsidy under the effects of climate change on crop yield. We present the results for selected commodities including outputs and prices of aggregated three food items (Table 1): paddy rice, crops (all the other agricultural sectors), and livestock (ruminant, dairy farm cattle and non-ruminants). There is output redistribution for agriculture under the Tax + CY regime. Overall, the burden of the carbon tax on outputs (including goods and services) together with the adverse effects on yields drives down crop production for many regions. Paddy rice, ruminant and dairy farm outputs suffer the most due to their emissions (Table 1). Golub et al. (2013) have shown that a global 27$/tCO2e tax-subsidy policy negatively affects agricultural sectors of the developing countries, even if agricultural producers of these countries receive a refund for their tax expenses. Our results in the Tax-Subsidy case (in which we propose a higher rate to decrease net emissions by 50%) follow similar behavior, although with more dramatic reductions in output. 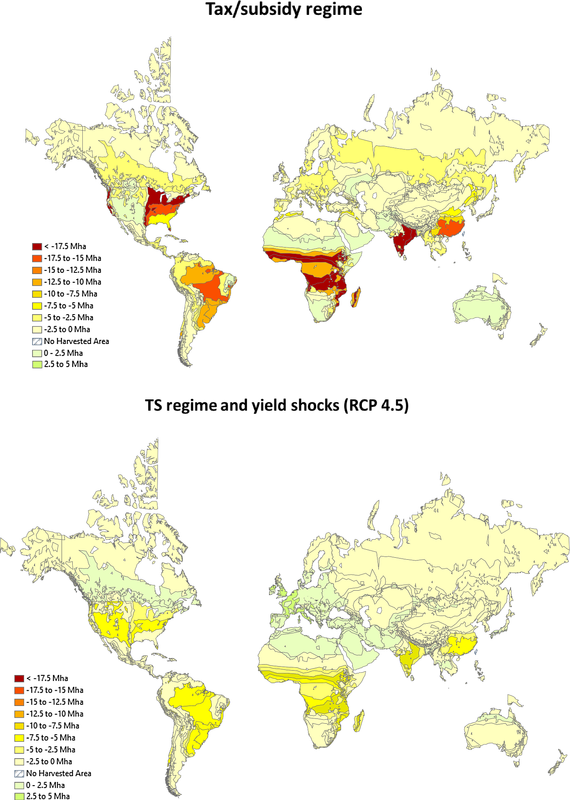 We expand the context of the results by incorporating the crop yield shocks. This addition shows that under the presence of climate change, the repercussion on agricultural output is worse when forest subsidy plays a role in the mitigation effort (TS + CY scenario) (Table 1). This is caused by the overall reduction in harvested areas due to forest expansion together with losses in agricultural productivity. This drives down output for almost all the crops across the world, with few exceptions (Central European countries and Canada), which increase their output to satisfy their self-consumption and export food commodities. Because of the inelastic food demand, the changes in prices are higher than changes in output. In the Tax + CY scenario, prices go up for all crop products, and as expected, it is significantly higher for ‘dirty’ agricultural sectors due to the addition of the carbon tax regime of $155t/CO2e. Thus, for paddy rice and the livestock sectors, we have price increases higher than 50% for almost all the regions (Table 1). Declines in GDP and private consumption vary among regions. In countries such as India and other developing regions, some production declines can be made up by foreign trade, but not all. The implementation of the $100/tCO2e tax and subsidy changes the situation. Prices for (both non-carbon and carbon intensive emitter) agricultural commodities increase overall in the TS + CY compared to the Tax + CY scenario. This is a result of the land competition between forest and agriculture and low crop yields. Thus, the prices for most agricultural products are often more than triple (+ 200%) their original value. Hence, the loss in productivity is expressed in higher commodity prices. As a result, this further reduction in food supply and dramatic rise in food prices then acts as a major threat for food security. People, particularly low income groups, would have to spend a larger share of their income on food products, especially in emerging economies where agriculture is an important subsistence activity (Sub-Saharan Africa, South East Asia, India, South and Central America). Livestock prices also increase dramatically under both scenarios. Nevertheless, in some regions, the situation is worse under the Tax + CY regime (with a high tax of $155/tCO2e) because this sector is heavily penalized due to its emissions from ruminant animal enteric fermentation. Trade balance is the difference between regional exports and imports. Many places (India, Sub-Saharan Africa) increase their trade deficit in agricultural commodities under the TS + CY scenario due to the adverse crop yield shocks. This drives up import prices, which motivates some regions (United States, Central Europe and Oceania) to increase their net food exports. The results are similar under the other CY scenarios. The consumer price and GDP impacts vary by case. Interestingly, in many (developed) regions the Tax + CY regime causes CPI to increase more than imposing a TS + CY policy. This is because the high carbon tax affects all sectors in the economy, thus driving up overall prices more than in the TS + CY case which affects mainly commodity and food prices. Also, food is a smaller share of total income in richer countries. In contrast, for several developing regions, especially the ones that were more affected by land use change and loss in productivity (e.g., South Asia, India, China, South America, Sub-Saharan Africa), the overall prices are higher under the tax-subsidy regime (Fig. 6). Both policies decrease real GDP (which is endogenous in our model) across the world. Nevertheless, the tax-subsidy regime (TS + CY) scenario drives more abrupt declines in private consumption and energy production, and changes in imports, which ultimately decreases GDP by 0.1%–9.9% for most regions in the world. The situation is more severe for developing economies (Sub-Saharan Africa, Central and Eastern Europe, Latin America, China, India) because of their higher dependence on agriculture and decrease in net exports (which is a component of GDP) (Fig. 6). Table 2 shows an overall decline in welfare (a measure of economic well-being in US$ termed equivalent variation [EV]) under the imposition of both policy regimes. We compare first the situation with no climate change effects, which has been the common practice in previous studies. Here, our results suggest that implementing the Tax-subsidy regime drives a global welfare loss of about $457 billion, which is lower than the EV loss from applying the Tax-only regime (− $760 billion). Our results also show that is unlikely, considering the adverse impacts on agriculture, that most developing regions would implement a carbon tax, which is also supported by Hussein et al. (2013). Likewise, our conclusions are consistent with the literature which considers FCS as a cost-effective method compared to other mitigation alternatives (Adams et al. 1999; Golub et al. 2010; Richards and Stokes 2004; Sheeran 2006; Sohngen and Mendelsohn 2003; Stavins 1999). Climate change provokes adverse impacts mainly in (i) technical efficiency (i.e. effects of lower productivity) due to crop yield losses in all regions and (ii) allocation efficiency (i.e., changes in inputs and intermediate products from one sector to another), due to the reallocation of resources (e.g., more labor for agriculture, substitution of energy by capital, among others) (Supp. Table 2). As a consequence, the simulations suggest a significant underestimation of social welfare losses if the agricultural productivity change is not included in the analysis of both policies. This is especially true for the FCS case, in which these climate change impacts represented an additional $650 billion loss in welfare. In addition, incorporating the overall adverse effects on agriculture provides an important insight. Under the presence of climate change, FCS becomes a less attractive alternative due to: (1) land use competition, (2) increased commodity prices and land rent, (3) larger reductions in private consumption and output production, and (4) lower real income in many regions. Thus, the welfare losses are $200 billion larger when implementing FCS subsidies compared to the Tax + CY scenario. In other words, including crop yield shocks reverses the conventional wisdom and suggests that a carbon tax only is preferred to the tax combined with FCS in terms of overall economic well-being. In order to compare the welfare losses between RCP 4.5 and RCP 8.5, we first take the difference between the policy regime scenario and its respective policy including the climate change impacts on agricultural productivity. Specifically, we take the difference between Tax + CY and Tax-Only scenarios. We do this calculation in order to isolate the effects of the additional losses from the adverse crop yields under the RCP4.5 which permits comparison with the consequences under the RCP 8.5. The procedure is similar for the tax-subsidy regime. The global welfare loss due to lower crop productivity under both mitigation methods (− $154 and − $650 billion, respectively) is lower than the total EV loss due to crop yield shocks under business as usual (CYBAU scenario), which is $726 billion (Table 2). This result suggests that there is an economic benefit of mitigating crop yield losses of about $76 billion under the tax-subsidy regime and approximately $570 billion gain worldwide under the tax-only policy. This net benefit is before considering all the other benefits of mitigation and adaptation in other sectors, so it is, even in isolation, a strong case for mitigation. The study assumes a constant annual-equivalent tree rotation. However, we are aware that harvesting and tree rotation can change in the future depending on the management practices of the region (Sohngen and Mendelsohn 2003). Considering changes in rotation (i.e. assuming FCS is reduced due to longer time horizons reaching a limit in sequestration) would only worsen the already dramatic effects on prices but would not change our conclusions. Our study makes use of a specific combination of GCM-crop models. There are a vast number of combinations in the AGMIP tool that vary in productivity values depending on the assumptions of each model. Our choice was based on the number of crops available for the time-period evaluated. Other combinations have been evaluated and compared in the literature such as discussed in Moore et al. (2017). Their study confirms that, controlling for differences in methodologies and the representation of CO2 fertilization effect, there is little evidence for statistical differences in the yield response to warming. Our current work does not implement transfer payments from developed to emerging economies. This is an important aspect for regional development, but this does not affect our major global results, it only affects the distributional effects. FCS has been suggested in the literature as a good alternative to mitigate climate change effects. In order to evaluate its effects on the global economy and food supply, we developed a new static computable general equilibrium entitled GTAP-BIO-FCS. We evaluated the effects of a carbon tax and sequestration subsidy to understand their role in the GHG emission reduction. We also included the effects of climate change on crop yields from GCM-crop modeling to analyze how the economic situation could change under these adverse impacts using both policy regimes. Our estimates without climate induced yield losses support previous findings in terms of the importance of FCS as a mitigation method for climate change: The cost of implementing FCS in terms of income and welfare (through sequestration subsidy) is lower than using only a carbon tax regime when the crop yield losses due to climate change are not considered. However, our findings add an important dimension: when we incorporate the overall adverse effects of climate change on agricultural productivity—the cost for society of providing FCS incentives can become a threat for food security because it increases the competition for land between forestry and agriculture and that significantly boosts crop prices and land rent. An aggressive FCS policy drives a major decline in food and livestock production across the world leading to substantial increases in food prices, higher than 200% in many regions for most agricultural sectors, especially emerging economies. We observe this effect more clearly when we compare it to a tax-only regime to reduce emissions 50%. This shows the importance of including climate change crop yield impacts when evaluating the benefits of FCS as a mitigation method. It also shows very clearly that impacts of any policy can change significantly as its application increases. Unexpected outcomes are not seen at small scale but can be substantial as scale increases. There are four important implications of this research. First, developing countries are affected much more severely than developed. Second, because of the severity of the estimated impacts, it may prove quite difficult to negotiate stringent emissions reductions policies. This research highlights an important trade-off between food security and GHG reduction, especially for developing countries. Politically, it will be nearly impossible for developing countries to accept the food price increases and GDP losses. Third, the results cry out for investment in agricultural research on climate adaptation. The outcome of the paper is clearly undesirable, but it could be softened with improvements in agricultural productivity in the face of climate change, as suggested by recent literature (Magnan and Ribera 2016; Neumann and Strzepek 2014; Weyant 2014). 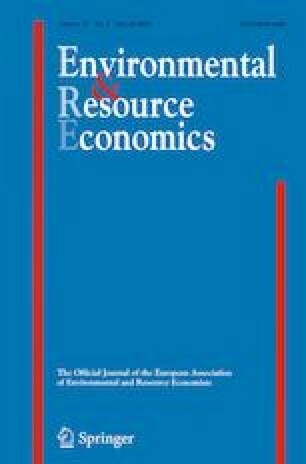 Finally, our results suggest that mitigating the adverse effects on climate change could result in an economic benefit compared to a business as usual scenario. In other words, mitigation pays even in this likely worst case comparison. This net benefit is valid even without considering all the other mitigation and adaptation efforts in other sectors. Partial funding for this research was provided by the Purdue Climate Change Research Center (PCCRC) and the Ludwig Kruhe Fellowship, Purdue University, U.S. We are also thankful for the suggestions by Dr. Thomas Hertel who provided important insights that improved our study. All authors contributed on all aspects of research designed and execution.